After just one critically-acclaimed season, FX's The Bridge is already considered among the best shows TV has to offer, winning a coveted Peabody Award earlier this year, alongside highly-lauded programs such as Breaking Bad, House of Cards, Orange Is the New Black and Scandal. A few weeks ago, I was invited to attend the red carpet premiere for Season 2 of The Bridge, which debuts Wednesday, July 9 at 10 PM ET on FX with "Yankee", it became immediately clear that the show is not resting on its laurels. 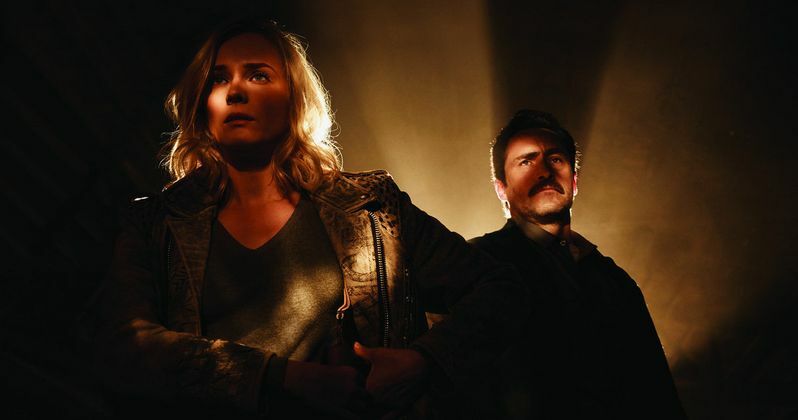 Diane Kruger and Demián Bichir return as El Paso detective Sonya Cross and Juarez detective Marco Ruiz, who find themselves at a crossroads in their unique relationship after the explosive events of the Season 1 finale. Diane Kruger revealed that Sonya and Marco's relationship will surely be tested in Season 2. "It will be tested this season. In general, it's a very dark season for Sonya, and a lot of her trusted entourage are letting her down. Our relationship will get tested." When asked how the season will be darker, Diane Kruger explained that, unlike Season 1, which followed Sonya and Marco's quest to find one serial killer, Season 2 will take a much different path. "There are lots of murders. We don't follow a serial killer, per se. It's more of a world, and the different storylines that somehow all connect. There are lots of dead people." One of the many reasons why Sonya is such a compelling character to watch is because she has Asberger's, an aspect that was never directly mentioned in the show, but was discussed often in the lead-up to the series premiere. When asked if she has a better grasp on portraying a character with Asberger's, the actress had this to say. "I don't think I'm ever going to be able to master her complexities, because how could I possibly know how one lives with Asbergers? I try my hardest to make her my own, and make it great in my head, and learn as much as I can about Asbergers, and try not to drop my gun every two minutes, which is actually harder. I feel she evolves a lot during the season. The writers are giving me great opportunities to show different sides to her in her private life. I think the audience will respond to that as well." One of the big changes in Sonya's personal life that fans will see right away is a potential romantic relationship with perhaps the most unlikely suitor one could expect for Sonya Cross: the brother of the man responsible for her sister's death. "I have a boyfriend this season, who turns out to be the brother of my sister's killer. So, it's not the healthiest relationship, but he stayed longer than a night." Demián Bichir also elaborated on Diane Kruger's comment that Sonya and Marco's relationship would be tested heavily in Season 2. "Yeah, they finish up Season 1 with a very difficult relationship. Right now, we have to look for each other again, because we need each other. There are many different issues that affect both sides of the border, and the only way you can solve them is by working together. They know each other very well and they respect each other and trust each other. Keep watching, because things will be interesting, to say the least." Also returning this season is Matthew Lillard as journalist Daniel Frye, who was nearly killed in Season 1 thanks to an inventive car bomb. Daniel is more driven by working with fellow reporter Adriana Mendez (Emily Rios), who is searching for her missing sister. When asked how much the traumatic events that happened to him in Season 1 informs his Season 2, the actor had this to say. "That's a good question. What informs him more is the story that they're on, and his relationship with Adrianna. He ends up with a limp for awhile, but I think that the biggest thing for him is he's on this story. He's kind of on this hunt for a Pulitzer, and I feel that's the thing that drives him, with Adriana's sister missing and all kinds of stuff. There's a story that pulls him through the year." The actor did add, though, that Daniel is still trying to kick his self-destructive habits in Season 2. "He kind of really loses it. Here's the great thing about the show. It's super complicated, and he, more so than anyone, is a super complicated person. That's good though. There's a big mystery in Season 2 and he's actively involved in trying to answer that riddle." While he didn't have the biggest of roles in Season 1, Johnny Dowers' played El Paso detective Tim Cooper, who was responsible for several of the comic relief moments throughout the first season. When asked if that would continue in Season 2, the actor had this to say. "You know, a little bit. That's kind of what I was hired to do, and I come from a comedy background. But this year, I get to do some good police work. Yeah, he's still unfiltered, and there are a lot of ad-libs and comedy, but I definitely get to do a lot more police work. Hank (Ted Levine) and Cooper have a great relationship, and he's trying to harden me up a little bit. He gets perturbed when I take things too colloquially, so to speak. There's some hard-nosed stuff. It's an edgy season, so I try to brighten it up a little bit here and there, with some Southern humor." The actor wouldn't tease any specific plot developments, but he did hint that there may be some deaths that surprise the fans this year. "It's already been said, but don't get too attached to anybody, on either side of the bridge. It's definitely realistic, which is why we got the Peabody Award, and the writers are following the exact stories. I know Hollywood does what it does, but they're actually following both sides of the border." That wraps it up for my coverage from the Season 2 premiere of The Bridge, which debuts Wednesday, July 9 at 10 PM ET on FX with "Yankee". While it will certainly be no easy task to top the intensity and the gripping storytelling from Season 1, I have no doubt that The Bridge will continue stepping up to the challenge.